Downloadable edition of printed book! Ages 13 through adult. 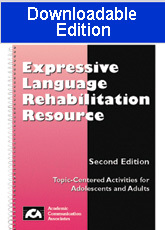 The second edition of this popular volume includes a variety of activities for stimulating oral expression in clients with language disorders. The activities focus on word retrieval, describing situations and activities, associating concepts, solving problems, and other skills. Oral and written language activities are included. Word Definitions - Client is asked to define vocabulary items such as "detergent," "dairy product," and "discount." Functions - Client is asked to give the function of items such as "receipt" and "paper bag." Phrase Completion - Client is asked to complete phrases such as "fork and _____." Scrambled Sentences - Client is presented with words from a sentence in random order and must re-arrange those words to construct a sentence. Story Completion -Client is presented with a short story starter and must complete the story. Questions and Answers - Client is asked to respond to questions such as, "When is it better to pay cash than to write a check?" Story Recall - Client is asked to retell short stories and to answer several questions about each story. Problem Solving - Client is asked to solve problems in response to questions such as "What would you do if you saw someone shoplifting?" Number Concepts - Client is presented with tasks such as the following- "You want to buy breakfast cereal. It costs $3.50 but you have a coupon for 75 cents off. How much will the cereal cost." Items have large, readable type. You can present items orally or clients can read them from reproducible worksheets.